Judge Beverly Wood (center) with Hoang Leclerc and Bailiff Vince Simpson have volunteered their time with the Marin Community Court since its inception in 2011. 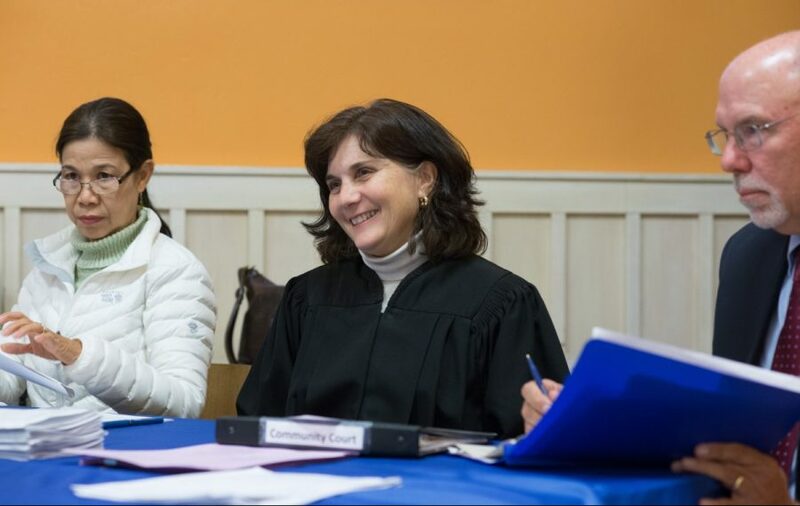 The first of its kind in Marin, the Marin Community Court debuted in April of 2011 with the goal of helping homeless defendants, and others living at society’s margins, to confront the justice system with confidence. Our collaboration with the Marin Superior Court and the St. Vincent de Paul Society of Marin County has since assisted more than 1,000 Marin residents to resolve their current or outstanding minor infractions (e.g. jaywalking, sleeping in public parks), and allows them to turn their lives around with a fresh start. The court receives project funding from the Peter E. Haas Jr. Family Fund, the van Löben Sels/RembeRock Foundation, the County of Marin and Silicon Valley Bank. It has provided Marin County and the participants several hundred thousand dollars in savings, and currently represents over 10,000 hours of community service to Marin since 2011. 2,970 hours of community service and 314 alternative sentences completed by 124 participants (sobriety programs, mental health care services, life skills training, tra c school, drivers license renewal and vehicle insurance and registration). 22 participants obtained the veterans services due to them by law.